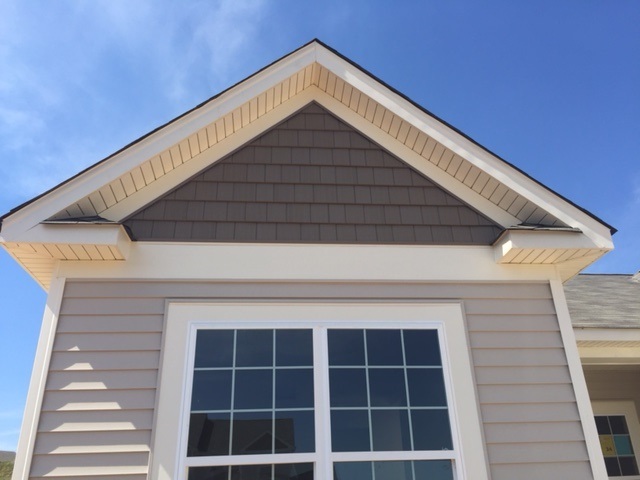 MiraTEC® Treated Exterior Composite trim combines the eye-catching beauty of cedar with the long-lasting performance of an engineered product. 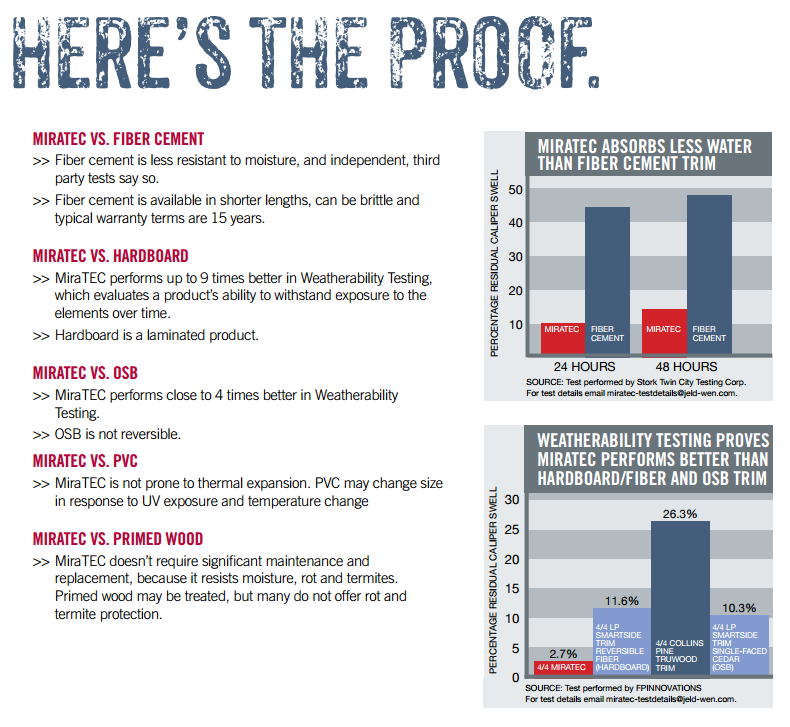 Because it is not hardboard, MiraTEC trim will not delaminate, is moisture, rot and termite resistant, and is backed by a 50-year limited warranty. How is MiraTEC trim made? MiraTEC trim is a treated wood composite trim made using the TEC™ sealed-press manufacturing process. This process was designed specifically for MiraTEC trim. In this patented process, wood fiber, phenolic resins, zinc borate (a wood preservative), a water repellent and other ingredients are combined and formed into a thick fiber mat. This mat is loaded into a sealed cavity. Steam is introduced during the pressing process to facilitate uniform heat transfer throughout the mat, resulting in a board that has exceptionally consistent physical properties. Critical factors can be set during this process to produce a firm surface for superb paint holdout and performance. The wood preservative and phenolic resin provide moisture, rot and termite resistance, and further enhance long-term performance. MiraTEC trim is also termite resistant. 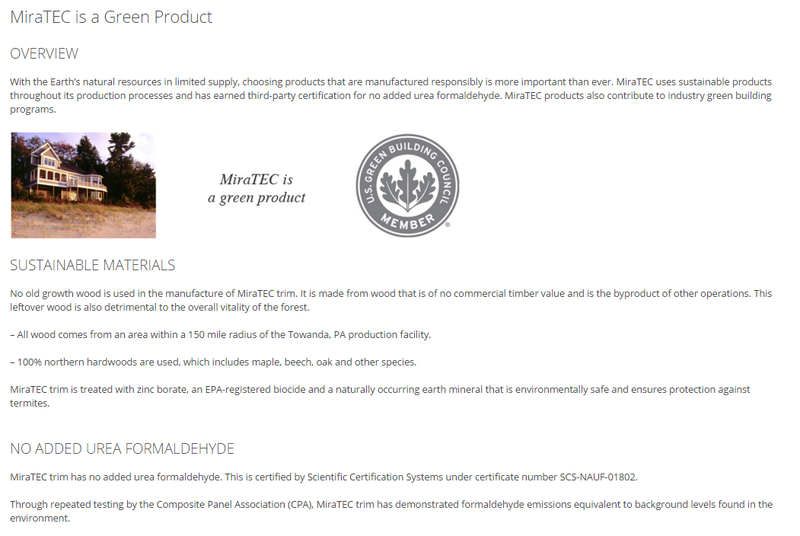 Due to this unique technology, MiraTEC trim is backed by a 50-year limited warranty. How is MiraTEC trim different from wood or wood-based trim products? 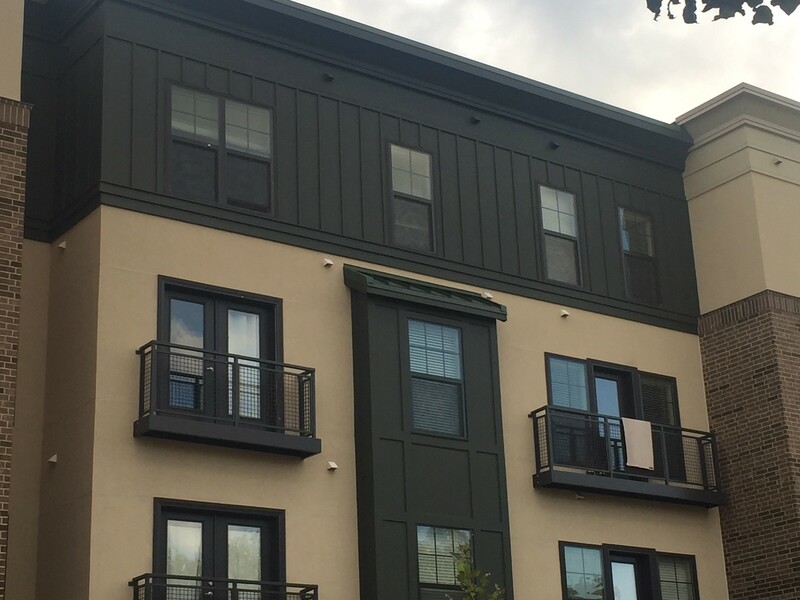 Unlike MiraTEC trim, wood trim has knots and imperfections, does not generate 100% yields, is not available with a warranty and is typically not sold with a factory-applied primer. 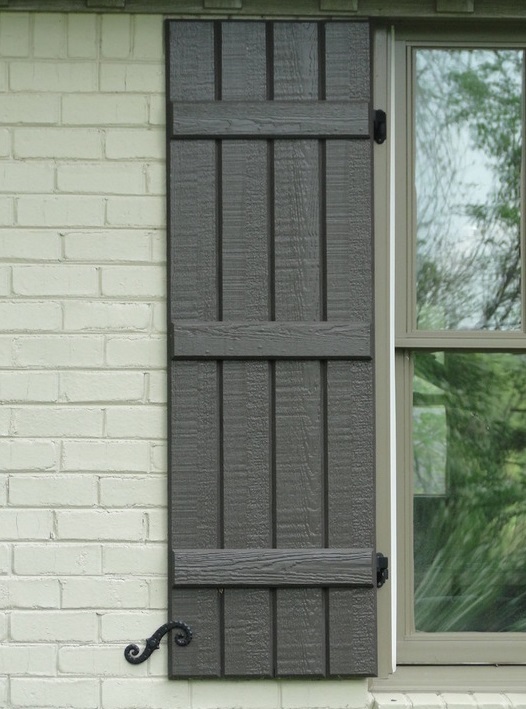 Most wood composite trim products available on the market today are composed of hardboard. Most of these products are made from two pieces of hardboard siding laminated together. 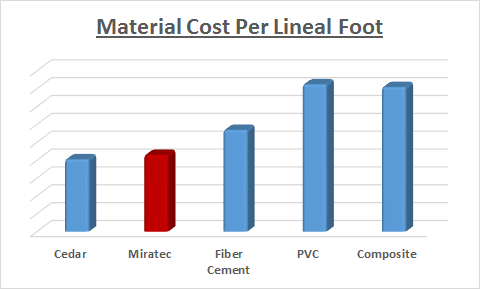 Unlike MiraTEC trim, these products are prone to delamination and are not as durable as MiraTEC trim. Most of these products have less warranty protection than MiraTEC trim. What’s the best way to prime and paint MiraTEC trim? MiraTEC trim is factory primed and does not need to be re-primed. However, if the primer has been removed or badly scuffed or scraped during transit or handling, you can re-prime it. For best results, use a high quality oil-based primer designed for use on wood. 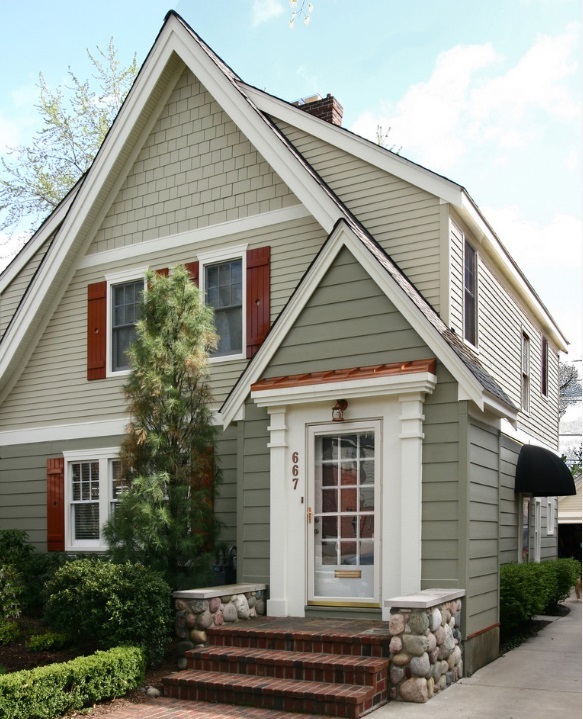 Paint MiraTEC trim with two coats of high-quality exterior oil or latex paint designed for use on wood. If you have to re-prime it, make sure the topcoat is compatible with the primer. Use a brush for best results. SeeApplication Instructions for best detail. Top quality paints will give you the best performance and long-term lower cost. Do I need to prime and paint cut edges? This is necessary only if the cut edges will be exposed to the weather. Prime and paint as noted above. All joints should be treated per our application instructions. What’s the best way to finish nail heads on the smooth side? The nails should be set flush or slightly countersunk (not to exceed 1/8˝ ). Then apply an exterior grade spackling putty specifically designed for filling nail holes. Allow putty to dry, sand smooth with 100 grit sandpaper and spot prime before painting. Over time, spackling putty may need to be replaced or touched up. Can MiraTEC trim be mitered? MiraTEC trim can be mitered for joints or column posts. Nails should be positioned no closer than 1/2″ from the edge. If desired, MiraTEC trim can also be glued. CMI recommends a polyurethane-based adhesive or quality exterior grade carpenter’s glue.